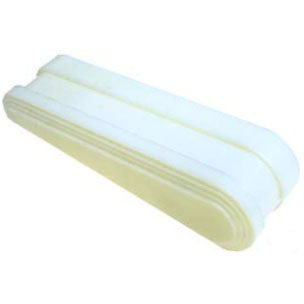 Replacement white plastic flipper cap for standard 3-inch long flippers. Used on Gottlieb late electro-mechanical (EM) and electronic solid-state (SS) games from approx. 1972 & up. Features ridged top edge and holds 1-1/2 dia. x 3/8 inch tall flipper rubber ring. Also fits Bally, Stern, Atari, Game Plan, and other similar designs. Cap secures to original metal bat/shaft- or shoe- with screw (not included) from bottom side- requires removal from playfield for replacement. GOTTLIEB: Card King, Flying Carpet, Grand Slam, King Kool, King Rock, Lawman, Now, Orbit, Outer Space, Play Ball, Roller Coaster, Sheriff, Space Orbit, Spirit of 76, Texas Ranger, more?